Is it OK to walk up hills? In response to a Guardian article – Is it OK to get off your bike and walk up a hill? Since hill climbs are close to my heart – I can’t resist chipping in. The truth is I’m torn between conflicting emotions. > “It’s better to die on a hill than surrender and walk up. The modern generation is too soft with its compact chain sets and granny gears. We should recreate the hill climbs of old – 12kg steel bike, fixed gears and the one who gets furthest up the hill without falling off – wins. That’s proper cycling – not this modern, get off and walk if you feel like it nonsense. The other chimp in me is the more reasonable, rational, politically correct version. >“Of course, there’s nothing wrong with walking up a hill. If it’s too steep, why not walk? We don’t cycle just for pride. Why risk damaging your muscles by overstraining? If you get caught out with a steep gradient – take a moment to enjoy the view, take it easy and just try to bring more gears for next time. Even pros can have to walk up hills at times. Only a man’s foolish pride would keep him chugging away up a 25% slope at 3mph – just so you can tell yourself you did it. It’s not as if anyone is there to judge you. And if they do judge you, so what?” Cycling is not a perpetual race and competition – it is something to enjoy. I’m not sure which chimp I prefer. You can pay your money and take your choice. But, ever since I took up cycling aged 13 – I can’t ever think of a time I have ever had to dismount and walk up a hill – even though I have come perilously close. Though it is quite possible I have got off and walked in the past, but somehow the memory has slipped quite out of my mind! Bushcombe Lane – the same over gearing on a hill which proved much more difficult than I ever imagined could exist in the south of England. Hardknott Pass – 30% wet and slippy. I had to go really wide on the hairpins. I particularly ‘liked’ that feeling of falling over backwards because the hill was so steep. Brilliant. The problem is there really is part of me, which enjoys that feeling of not knowing whether you are going to make it to the top. Usually when cycling you are in control. But, when you go up a 30% slope in the wet, you really feel at the mercy of the hill climb gods. It becomes a delightfully surreal challenge as to whether you can make it. In every case, I can’t resist giving it absolutely everything to avoid stopping and getting off and walk. From a rational point of view, it would have made more sense to walk the last bit of Wrynose Pass. I didn’t have anything to prove to myself or other people – by cycling at 3mph and 30 rpm and straining every sinew in my back. But, I did enjoy the ride more because I made it to the top without walking. Whenever I think of Wrynose Pass, I look back with fond memories – of the day when I killed myself to cycle to the top. That’s essentially what ‘we’ like about cycling – we want it to be hard, we want it to be difficult. The steeper and harder the hill the better. 100 Climbs has become a cycling phenomena. 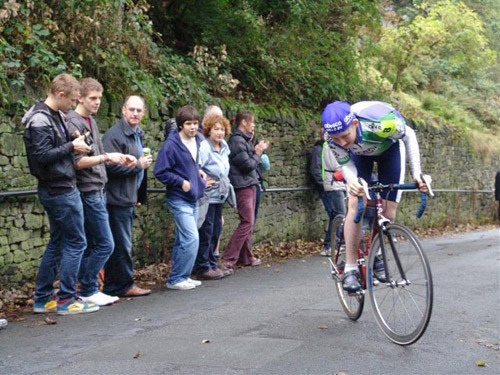 Hill climbing has never been so popular. This may leave you mystified. In which case, you will probably be much happier to take a breather, enjoy the view and walk when needs must – and don’t pay any attention to anyone who tries to tell you differently. But, for me the hill climb chimp is a difficult beast to contain and I can’t wait for a better weather to go back up to tackle Hardknott Pass, Rosedale Chimney and the rest. 8 Responses to Is it OK to walk up hills? Closest I came to walking up a hill was the first time I went up Streatly on standard gearing, I was so close to giving in but I just managed to keep the pedals turning and felt great at the top because of it. Now going down hill is a different matter, there was one very damp steep hill in Wales with a blind bend at the bottom and I was struggling to keep speed under control. I considered sticking myself into a soft looking hedge but thankfully I was able to pull up and get off without using the hedge. Walking down a steep hill in cleats isn’t easy by any means. Enjoyable perpsective on this. I am in the whatever you do dont walk category. I am not sure why but that has certainly served me well as when i started cycling in Sept 2012 I had to stop 3 Times going up Ditchling Beacon. I then thought I cant have this and then spent 3 months doing laps up a short hill near my house determined to return to the beacon and cconquer it which I did. What a feeling! Cant buy that feeling. 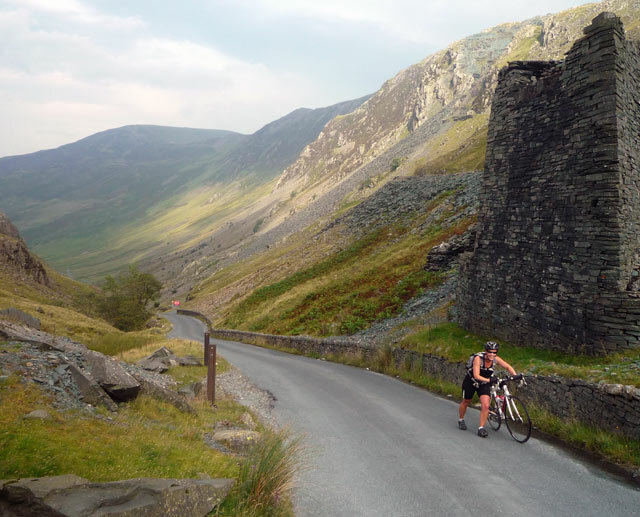 Roll forward to Sept 2014 and a group ride along the Fred whitton route. Ended up doing hill repeats up Ditchling Beacon as training as had the same I am not going to walk plan. Served me well as got up hardknott and wow what a feeling! I am nothing special as far as cyclists go but I love the challenge of a hill. Dont have a clue why…just love it! I’ve not walked the bike up a hill but going up the Struggle I had to stop, still astride the bike but feet on the ground, to catch my breath and recover. Then I started pedaling again. Does that count as cycling it or walking? Four months after a ‘heart attack’ at age 69, I decided to see whether I could still ride up steep hills, so I booked a couple of days in Ambleside. (I live in Northamptonshire, which has only short bits of uphill.) I ride a recumbent trike, fairly slowly – averaging 20 km/hr will do me – and set out for Wrynose and Harknott at 2 pm on a fine May afternoon. I managed Wrynose, with lots of stops for cars – didn’t see one cyclist on that Monday afternoon – and did the last bit of 25% at 2.8 KILOMETRES / hour at about 30 rpm on a 16″ gear. I thought better of carrying on to Hardknott, as it was getting towards tea-time, and I didn’t want to get the bonk, or end up trying to walk a trike uphill, so I turned back. I didn’t ‘suffer’, and found the climb within my capabilities. A trike is better than a bike for stopping and starting on a steep hill. I use toeclips and straps, and have in a previous existence failed to get my left foot into the clip before coming to a stop when restarting on a 20% slope. Although rear wheel slip becomes a problem at those gradients on wet roads. Nice. I never knew you could cycle that slow up Wrynose!